I always find it fascinating to read about recipes brought to this country from America's immigrant bakers. The fabulous stories of women and men, who learned from mothers and grandmothers, how to bake wonderful pastries, cakes, cookies and breads from their homeland. While out shopping yesterday, I came upon this beautiful book, "A Baker's Odyssey" by Greg Patent. It's a cookbook filled with the most delicious recipes from the kitchens of dozens of master bakers all around the country. The recipes come from Italy, Hungary, Spain, Mexico and Sweden just to name a few. I can't wait to try many more of them, but today I chose this cookie that sounded great..and it is! 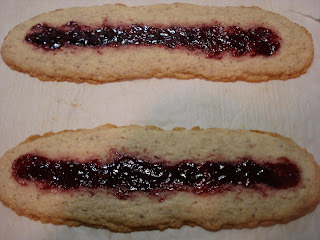 This classic buttery Swedish cookie is, to me, kind of a cross between and linzer cookie, in that it uses an almond shortbread type base filled with raspberry jam and a thumbprint cookie, also because it's filled with jam. It was easy to make and the taste is amazing! 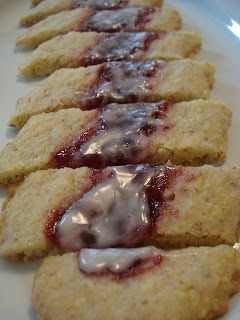 It's rich and buttery and the combo of the almond and raspberry is so wonderful. This would be a great Holiday cookie to make. You need to grind the almonds first. I chose to do this in my food processor with a little bit of sugar. 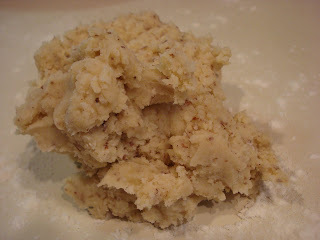 Then beat the butter and sugar and add the ground almonds. 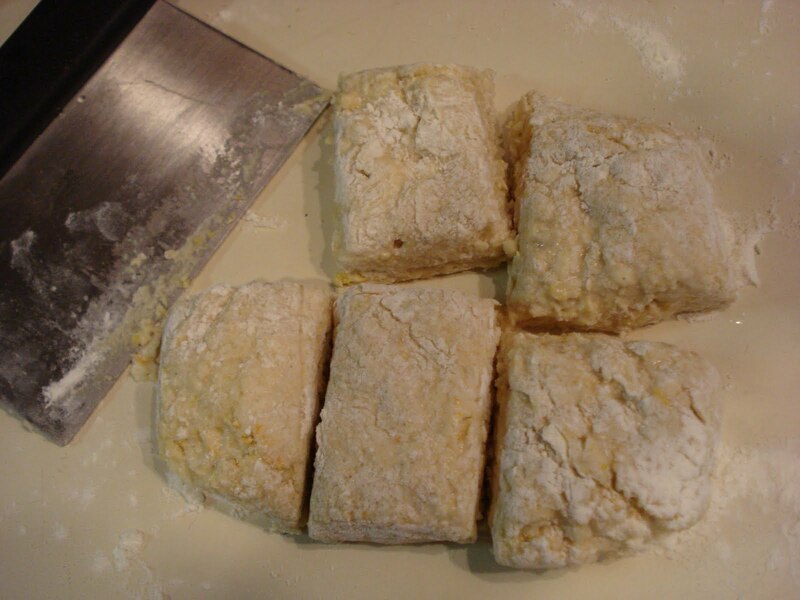 Divide the dough into 4 sections and roll out into 4 thin logs. The recipe didn't say to chill the dough but my cookies spread and I'm wondering if chilling the dough would have kept them thicker ( although I kind of liked the thin, delicate cookie). Take the end of a wooden spoon and make an indent down the center of each log, being careful not to make it too wide or too deep. Fill the depressions with the jam, using only a tiny bit, just slightly higher than the rims. Let them cool in the baking sheet placed on a wire rack. Make the glaze a few minutes before they come out of the oven so you can glaze them while they're warm. Spoon the glaze on top of the jam and let them cool a few minutes. Transfer the logs to a wire rack and cut 1 1/4" on the diagonal. Let them cool completely. 15 tbsp. unsalted butter, room temp. 1. 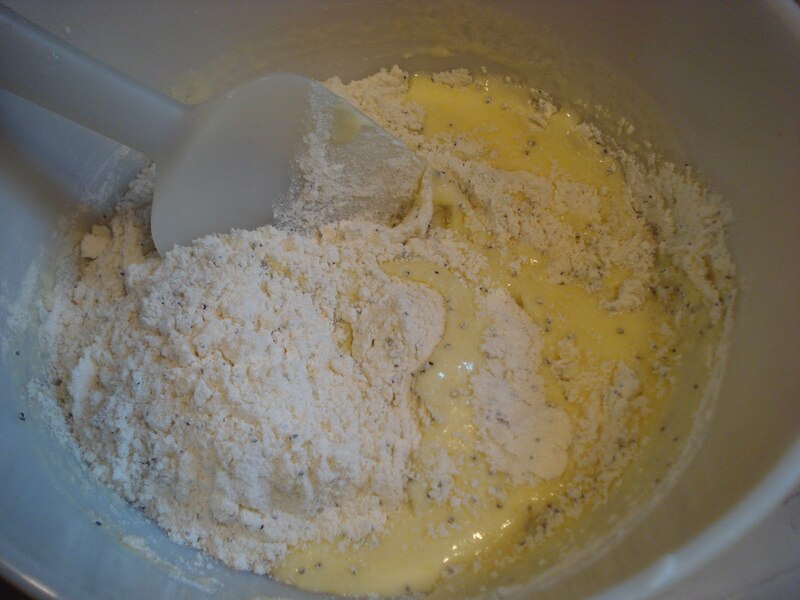 Place almonds in food processor with 3 tbsp. sugar and pulse til finely chopped. 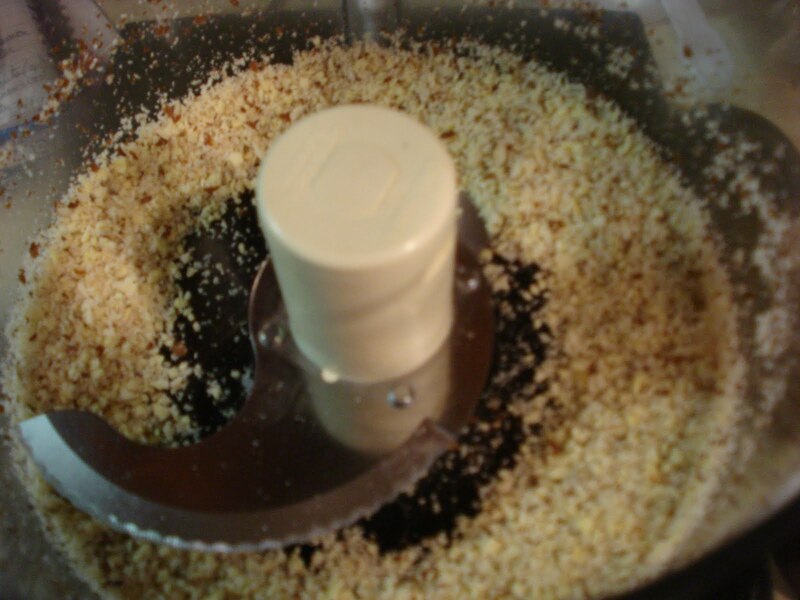 ( Or grind almonds using a nut grinder). 2. In a mixer bowl, beat butter about 1 minute, til smooth. Add sugar and salt and beat for 2 to 3 minutes, til fluffy. Scrape the bottom and sides of mixer bowl. 3. On low speed, beat in the almonds. 4. Gradually beat in the flour, beating only til incorporated. 5. Turn the dough out onto a floured work surface and shape into a disc. Divide the disc into 4 sections. Roll each piece into a log about 12" long and 1" wide. Place logs onto baking sheet. 6. Using your finger or handle of a wooden spoon, make a shallow depression down the center of each log. You may need to go up and down the log a few times. Be careful not to make the depression too wide or too deep. ( At this point you may want to refridgerate them so keep them from spreading). 7. 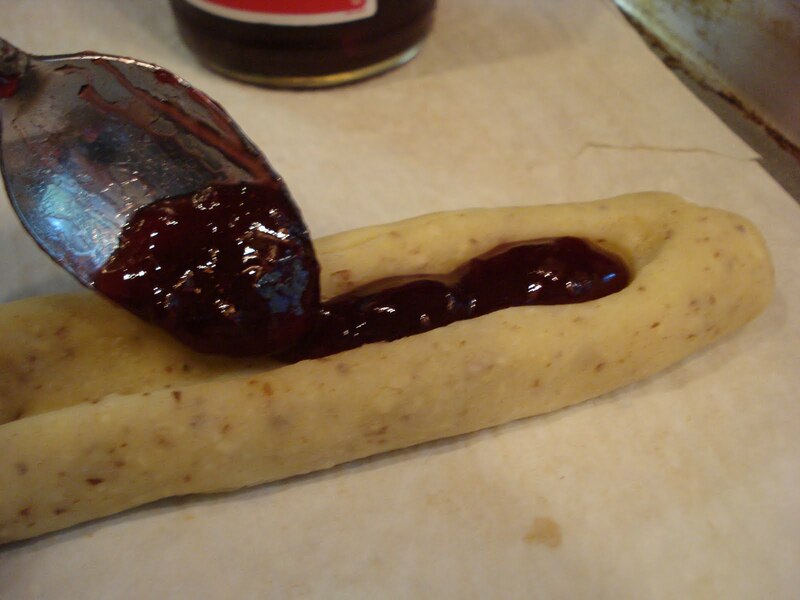 Using a small spoon, fill the depression with a little jam. 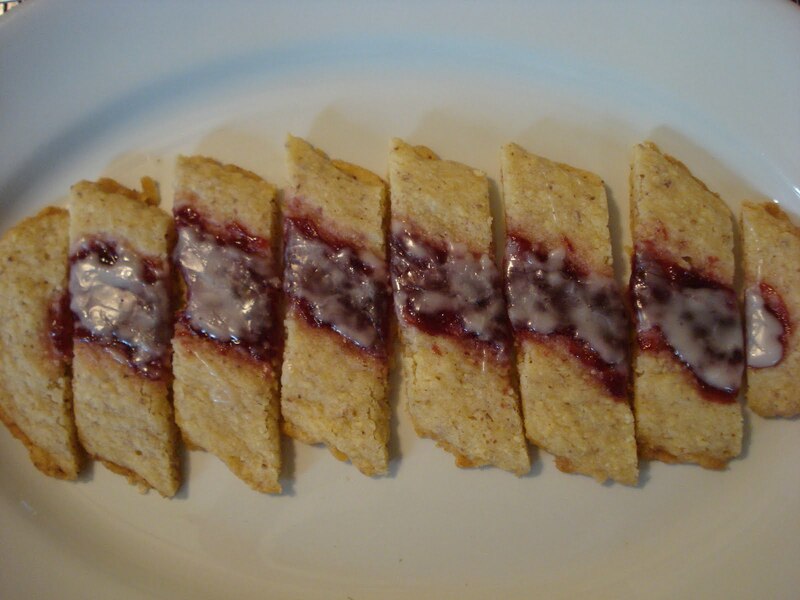 The jam should be only a tiny bit higher than the rims of the troughs. 8. Bake for about 25 minutes, or til the rolls are a light golden brown. Rotate the baking sheet once, halfway through baking. 9. Remove from oven and place on a wire rack. 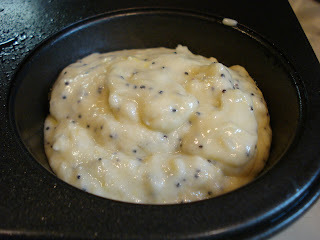 Glaze: Whisk confectioners sugar, vanilla and hot water to a consistency like heavy cream. 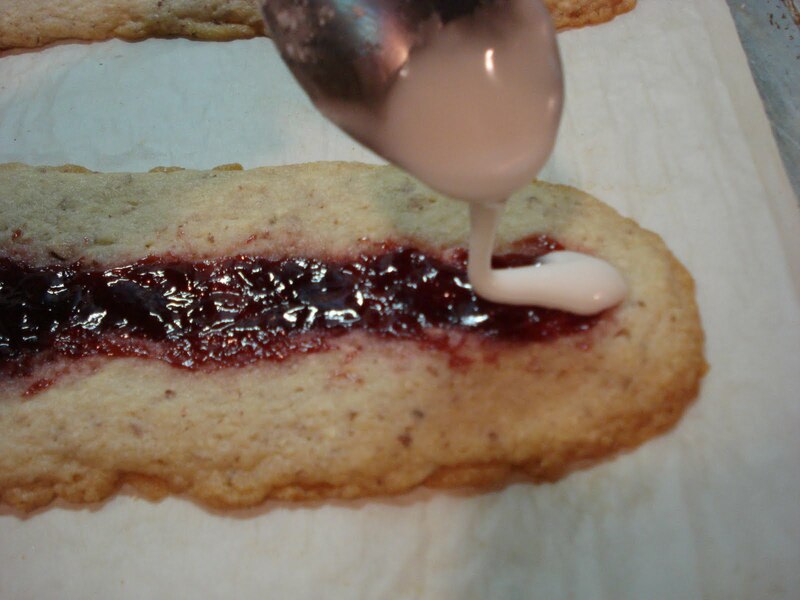 Spoon the icing over the jam, you may not need all the glaze. Cool for 5 minutes, then transfer the rolls to a cutting surface. Using a sharp heavy knife, cut 1 1/4" wide on the diagonal. Transfer to a wire rack to cool completely. Store airtight at room temp.. The cookies will remain fresh for a few days. 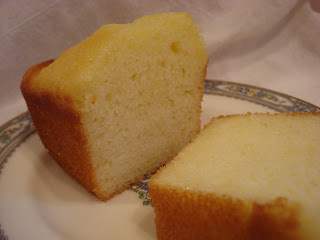 After making that wonderful French Lemon Yogurt Cake, using oil and yogurt, I decided I wanted to find a muffin recipe also using oil and yogurt, and lemon. 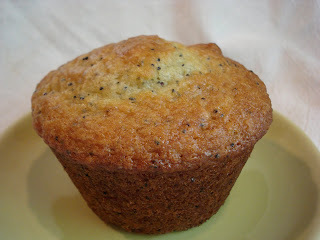 I thought about a lemon poppy seed combo and checked out a few recipes online and came up with one that sounded worth trying. So yesterday I put the recipe together and baked a few muffins, in the extra large size..Texas sized..I believe they're called! Guess everything's bigger in Texas! The recipe was basically good, but not yet great. The original recipe called for lemon flavored yogurt but I couldn't find any in the supermarket so I bought plain, whole milk yogurt. Because I wasn't using lemon flavored yogurt, I needed to up the lemon flavoring so I added more lemon zest and some lemon extract. The muffins turned out great, nice and moist from the oil, with an ample amount of lemony taste. 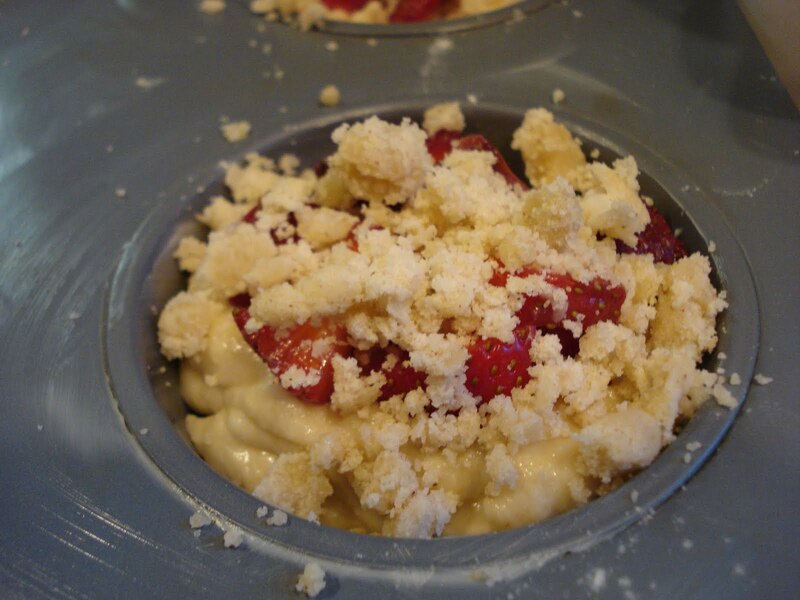 And they're easy to make, just combine the dry and the wet ingredients in 2 separate bowls, combine the 2 and bake. If you want a glaze, see my note at the end of the recipe. So, in one bowl, combine your wet ingredients. Then in another bowl, combine your dry ingredients. Then add the dry to the wet and stir til just combined..don't overmix. Scoop the batter into your prepared muffin cups. I used the extra large, Texas sized ones but you can, of course, use regular sized muffin cups. Preheat oven to 350. 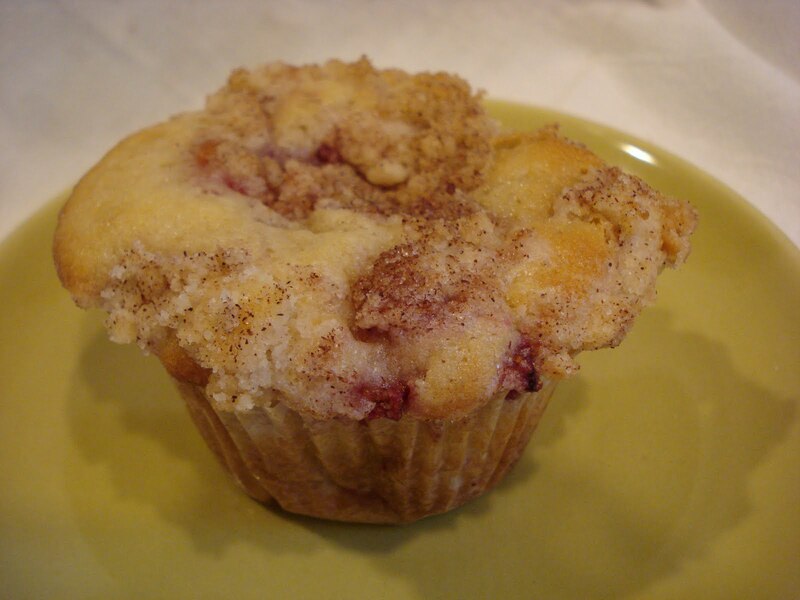 Spray muffin cups with baking spray or line with paper liners. 1. 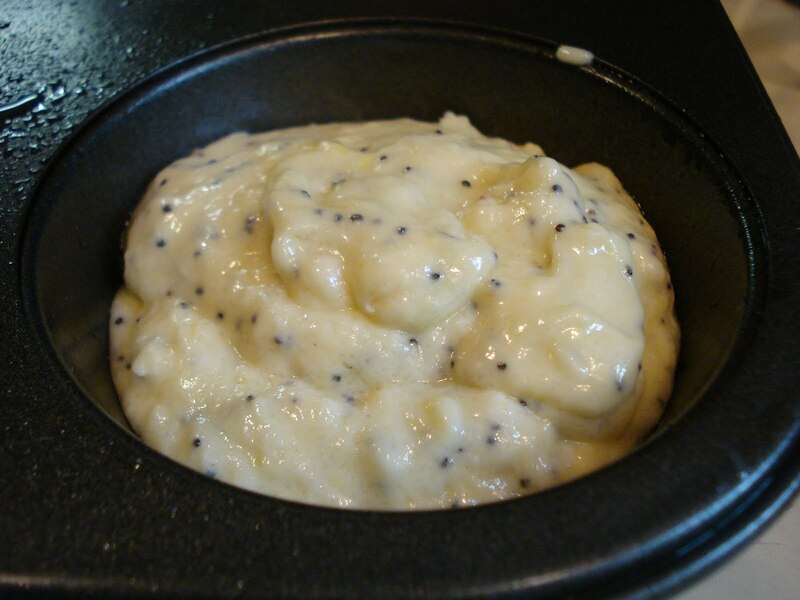 In a medium bowl, combine flour, sugar, poppy seeds, baking powder, baking soda and salt. 2. In a large bowl, mix eggs, yogurt, lemon zest, lemon extract and oil. 3. Pour the dry ingredients into the wet and stir just til combined. Don't overmix. 4. Spoon the batter into the prepared muffin cups, filling 3/4 full. 5. Bake 20 minutes or til a toothpick comes out clean. 6. Let the muffins cool in the pan about 5 minutes, then turn out and cool on a wire rack. Here is another recipe from the book I bought over the weekend called "America's Best Recipes". This Golden Crunch Coffeecake was a blue ribbon winner from the Virginia State Fair and I can certainly see why it won. It's so good! 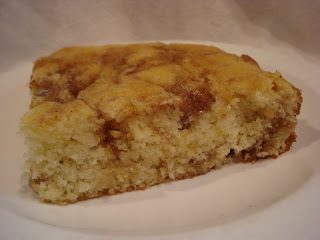 It's moist and the "crunch" comes from the brown sugar, cinnamon and nut topping that's put in the middle and again on top. 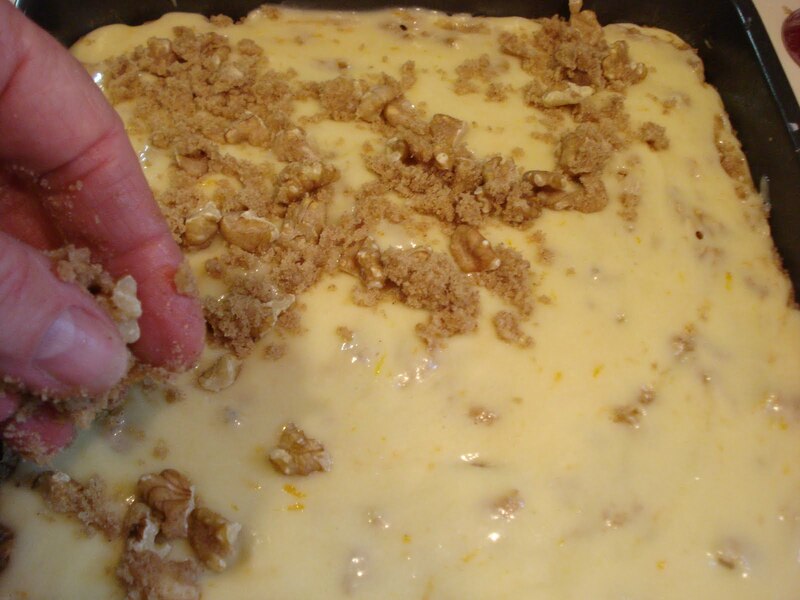 The only addition I made was to add some orange zest to give it another layer of flavor. 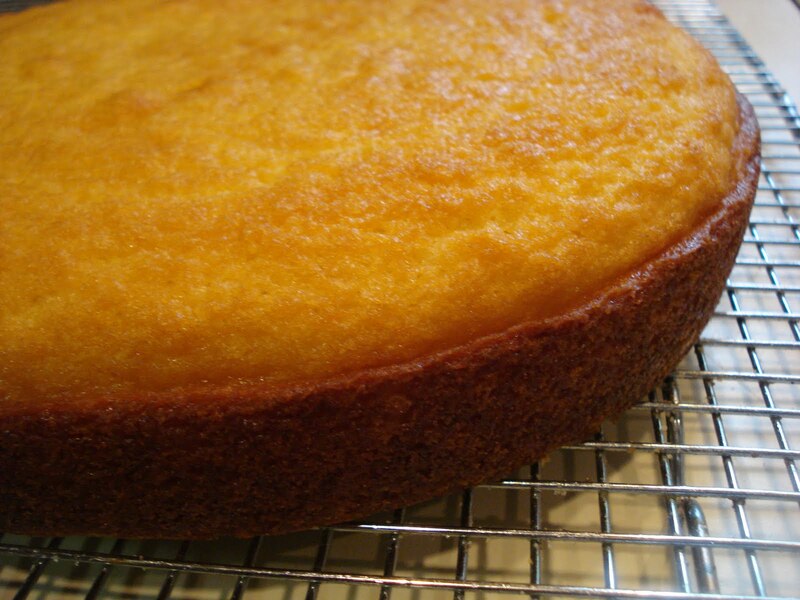 I like to use citrus zest in coffeecakes like this. You almost always expect the flavor of the cinnamon and brown sugar but that unexpected orange zest comes through to add another dimension. As usual, I halved the recipe, baking it in an 8" x 8" cake pan. You could replace the walnuts with pecans if you like them better and it would be great, too!. Preheat oven to 350. Grease a 13" x 9" x 2" pan. 2. 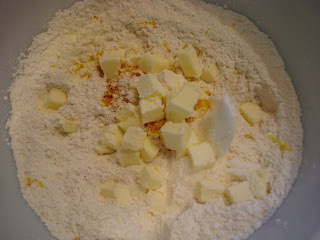 Cream the butter ,sugar and orange zest til light and fluffy, about 2 minutes. 5. 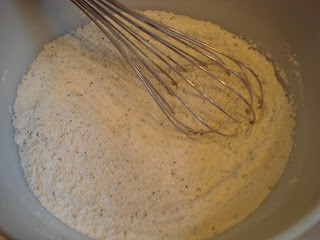 Add dry ingredients alternately with the milk, beating well after each addition. 6. 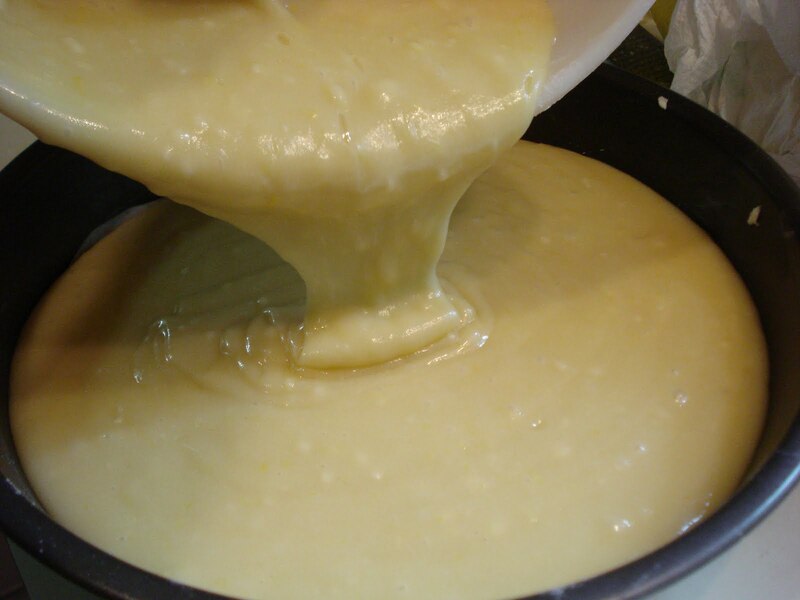 Spread half the batter into the prepared pan. 8. 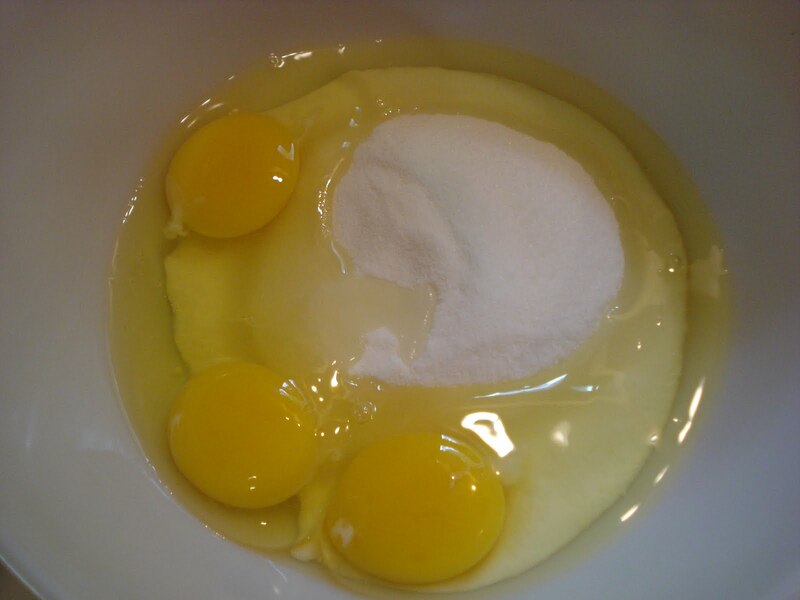 Sprinkle half the mixture over the batter. 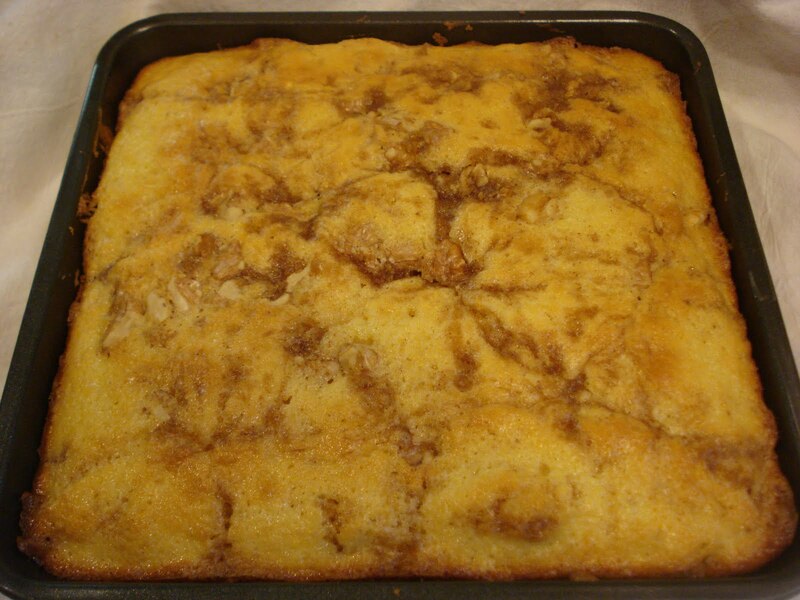 Spread with remaining batter and sprinkle remaining sugar/cinnamon mixture over the top. 9. Bake 45 minutes, or til golden brown and a toothpick inserted in the center comes out clean. 10. Cool the cake in the pan for at least one hour. It cuts better when it's completely cooled. It was a rainy Sunday today and because I was up very early, I decided I had plenty of time to do some baking before the indoor market began. 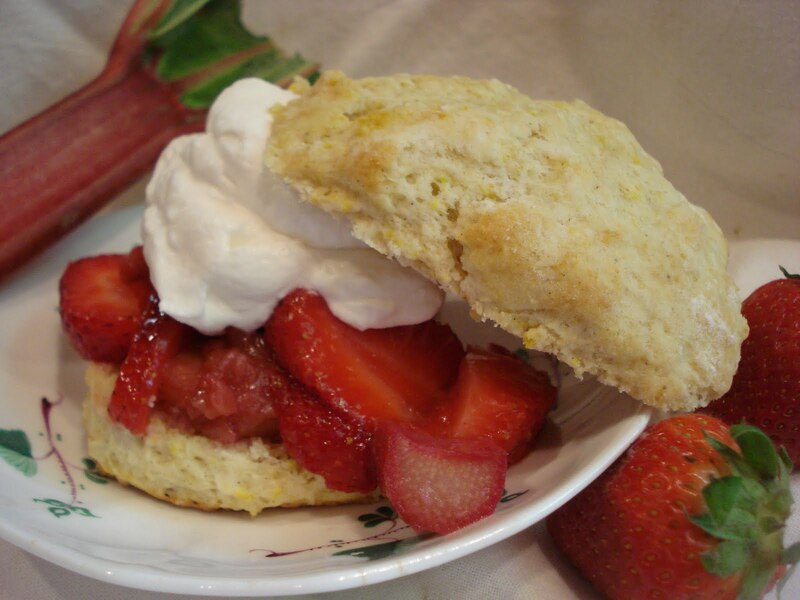 I had found a vintage cookbook called " America's Best Recipes", "State Fair Blue Ribbon Winners" at a flea market I went to yesterday and I wanted to try a recipe that was quick and easy so I chose this one. It was a blue ribbon winner from the Illinois State Fair. I looked up and found quite a few chocolate chew recipes on line but I didn't find anything exactly like this one. The recipe went together easily and quickly and although I liked the end result, I think with a little tweeking, it could be much better! It was definitely chewy from the oatmeal pecan base. Which is what I'd change up a bit. I think I'd put the oatmeal and pecans in the food processor and take them for a spin a few times to break them up more. I think the oatmeal flakes just needed to be broken down a bit more. And they could have been a little sweeter, so I'd add more sugar. But, everyone loved them, so here's the recipe. Oh I almost forgot, the recipe called for cherry extract but since I didn't have that hanging around my kitchen, I used vanilla extract. 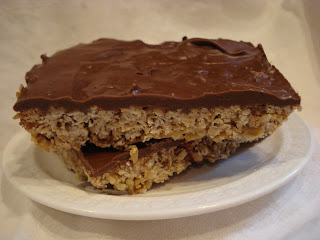 Chocolate Chew Bars ( Makes 2 to 3 dozen bars, depending on the size you cut them). 1. 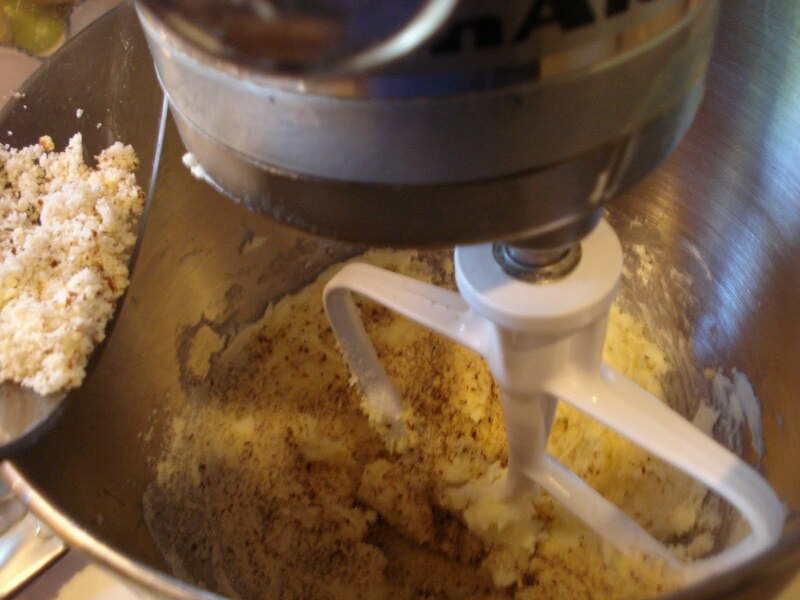 In a large bowl, blend the first 6 ingredients til crumbly. 2. Press mixture into an ungreased 9" x 13" pan. 3. Bake for 15 to 20 minutes, or til lightly golden brown ( Mine took a good 20 minutes). 4. In a small saucepan, combine the chocolate and peanut butter and cook on low heat til melted. 5. Spread over baked oatmeal base, chill and cut into bars. 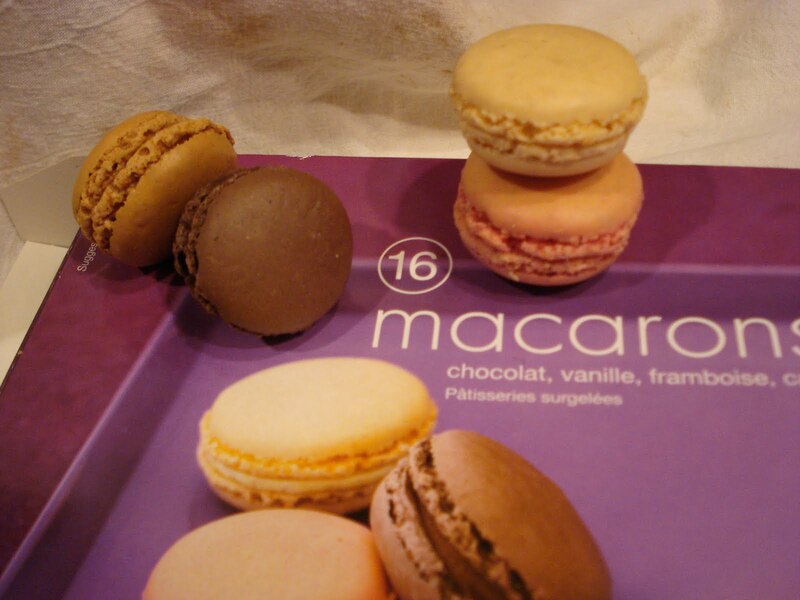 This is a quick post..just to share with you how fortunate I am ( and my son, Kris) to be able to have the chance to actually eat a French macaron..all the way from Paris! 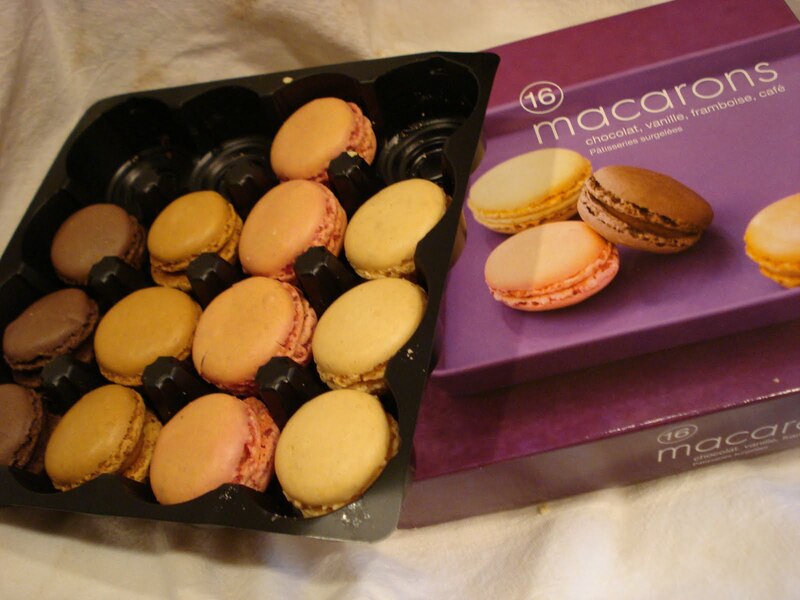 My friend, Bea, (you remember her), went to Paris last week and I asked her to please bring me back some macarons. I had heard and read so much about them but never tasted them. Maybe they weren't popular the 2 times I was in Paris..I don't remember. That was back in 1964 and 1971! Well, even though her flight was delayed by 3 days, due to the volcano erupting, she still brought me back delicious Parisian macarons! How lucky am I? She bought them in a bakery there. She said she could have bought them from the bakery case but if you're traveling, you can buy them like this, in their box. As you can see, I couldn't wait to rip open and devour the little jewels..vanilla, chocolate, coffee and raspberry flavors..all delicious and amazing! Now I know why all the fuss over these French treats. I can't decide which flavor I liked best. I really loved them all! Just wanted to share! And, yes, I need to try to make them myself. Or just go over to Paris..or both! 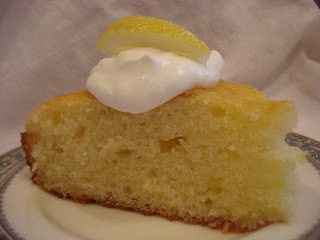 I resisted calling the title to this post " The Tale of Two Lemon Cakes"! A little corny, I thought. I found myself, once again, with an overabundance of lemons. The last time this occured I made this, which was amazing! Dangerously delicious but amazing. No no, we can't have that lying around again, calling me everytime I open the fridge door! So, I set out to find a lemon cake recipe. It seems like Ina Garten's Lemon Yogurt Cake recipe was very popular so I kind of felt I wanted to try to find another. Well, I checked out this one since I made her Banana Bread and it was the best! So I felt I was a sure thing. This cake, called "French Style Yogurt Cake with Lemon" or "Gateau au Citron", is apparently, an old French classic cake. The measurements are in "jars" which she states that 1 jar equals about 1/2 cup. So I decided to give this one a try..but I thought it might be kind of interesting to try Ina's anyway, just to compare. And, guess what, I liked this French classic one from Molly Wizenberg better. The recipe called for a little more than other recipes of this type but it turned out great. It was moist and lemony and it actually didn't have an overly oily taste or texture. And with a cake of this type, I'm sure it will just get better the longer it stays..not that it's going to hang around too long here! 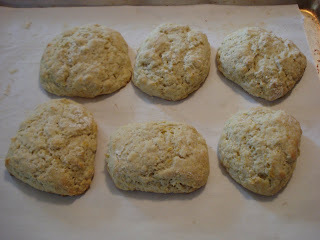 Ina's recipe, I had to halve, because I found myself almost out of flour, having just enough to make half the recipe. I used 2 mini loaf pans. Oddly enough, I found her recipe more oily than the French classic cake. It used less oil so I'm not quite getting why this occured, but I will try her recipe again, in all fairness, making the full amount next time. It was also more dense, which you can see in the photo above. One last note, both recipes called for a glaze but I omitted this so I could really taste just the cake part. 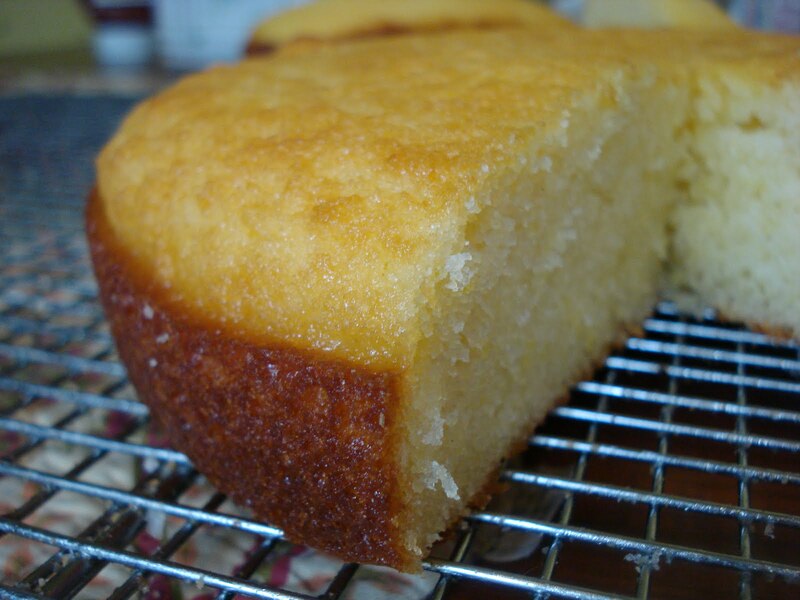 For the French Classic Lemon Yogurt Cake, combine the yogurt, eggs and sugar in a large bowl. And add this dry mixture to the yogurt mixture, mixing just to combine. Add the oil, carefully, and stir to combine it all..yes, it will eventually mix together! Pour into your prepared pan and bake til springy to the touch. I love how the sides are a deep golden brown..so good! Now you can glaze it.. or sprinkle powdered sugar over it ..or place a dollop of whipped cream on top..or make a fruity syrup to pour over it..or..just cut a big slice and scarf it down with some milk! The possibilities are endless!! And delicious! Butter and line with parchment paper a 9" cake pan. Preheat oven to 350. 1. 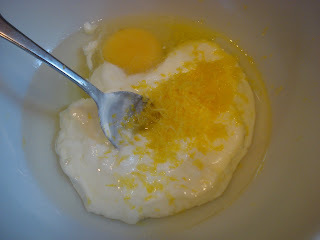 In a large bowl, combine yogurt, eggs and sugar, stirring til well blended. 2. 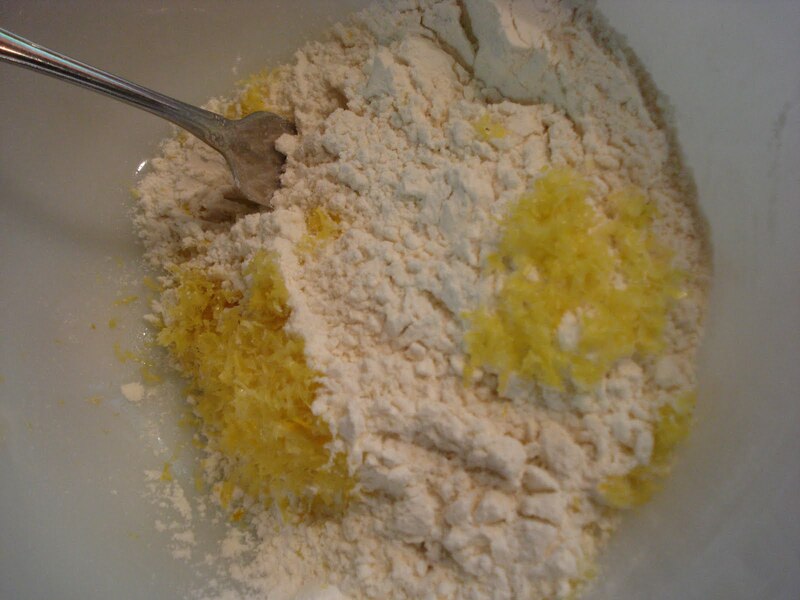 In a small bowl mix flour, baking powder and lemon zest together. 3. Add this flour mixture to the egg/sugar/yogurt mixture and stir to combine. 4. Add the oil and stir carefully at first. The oil kind of sits on top when you begin to stir this mixture and you have to be careful it doesn't splash out of the bowl..and on to you! 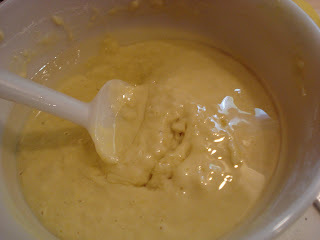 Once you continue stirring, it will eventually come together into a smooth batter! 5. Pour batter into your prepared pan and bake 30 to 35 minutes. 6. Check for doneness when a toothpick inserted into the center comes out clean and when the cake feels springy to the touch. Do not overbake! 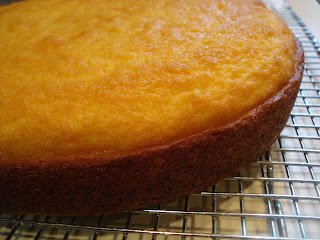 Cool on wire rack 20 minutes, then turn the cake out of the pan and allow to cool completely before glazing. 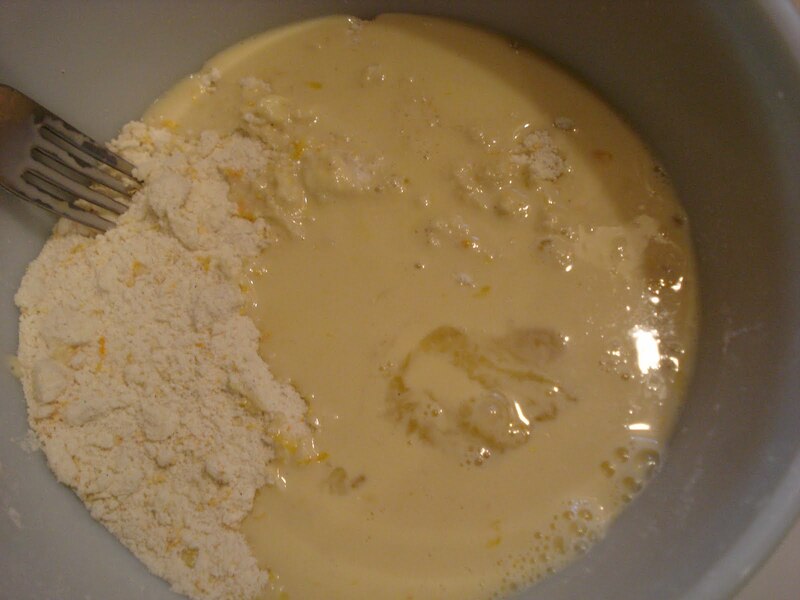 Combine juice and sugar in a small bowl and spoon it over the cake. I made these in a hurry yesterday so I didn't have time to take more photos but they are very easy to make..I feel like I say that about just about everthing I make! I gave it a very long title but it includes everything, chocolate chips, pecans and chocolate! 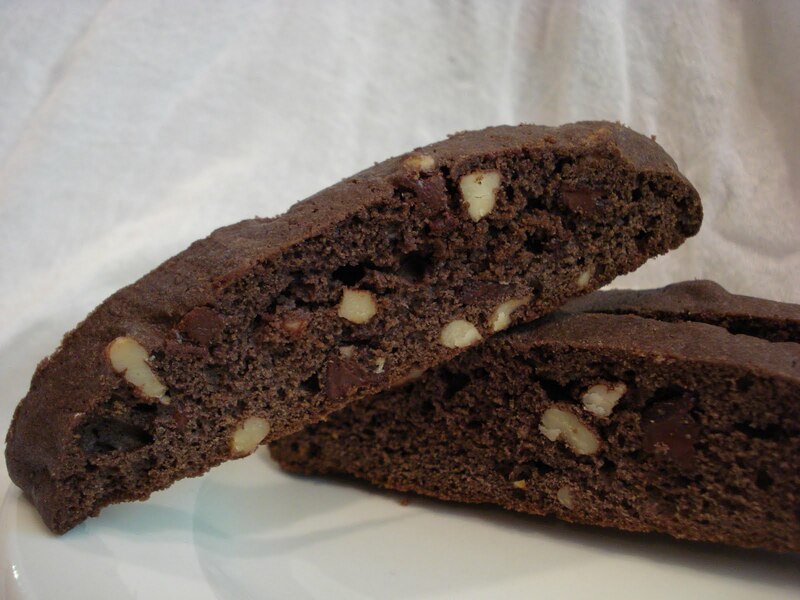 I used my usual biscotti recipe with a few changes to make it a chocolate biscotti, then I added some toasted pecans and chocolate chips. They came out great. Nice and crunchy but not at all hard, tooth breaking! The only other addition you may want to include would be to dip them or drizzled them with some melted chocolate. That would be delish! 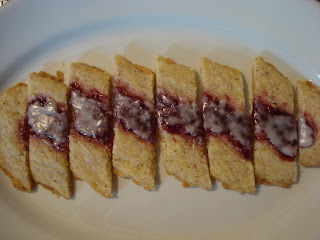 A few tips to slicing your biscotti: I often hear alot of people tell me that they have trouble with their biscotti crumbling when they slice it. I think there are a few reasons for this. 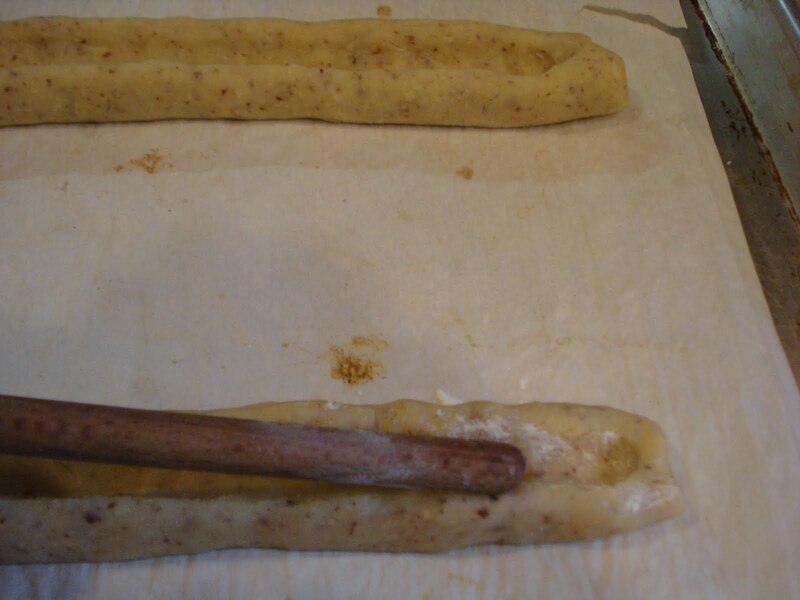 First, the biscotti must be firm to the touch on top to be considered done. 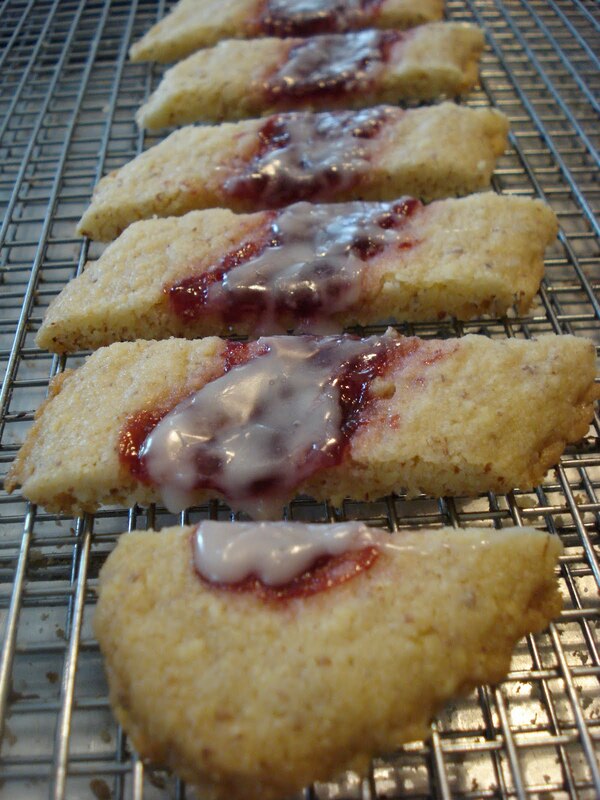 Second, you have to allow the biscotti to cool completely before slicing. This is the most important. You can even leave them out an hour and it would still be okay. Third, you must use a serrated knife. When you cut the slices, use a gentle sawing motion only halfway through, then just push the knife down to finish the cut. This is especially helpful when slicing biscotti with any dried fruits or nuts. Then carefully place the biscotti onto the unlined baking sheet and rebake the slices at a lower oven temperature. They will harden as they cool. If you think you'd like them harder, just pop them back in the oven again. It's really hard to mess them up! 1. 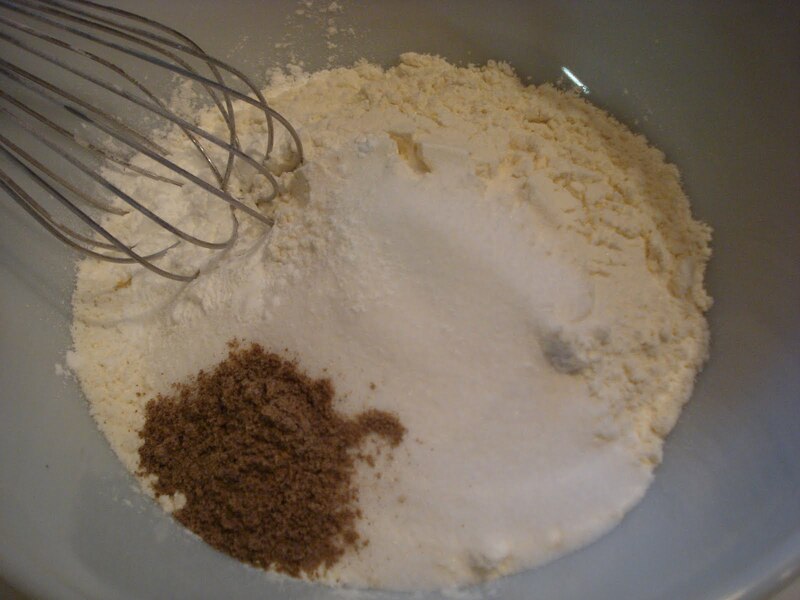 Combine in a medium bowl, the flour, cocoa powder, baking powder and salt. Set aside. 2. 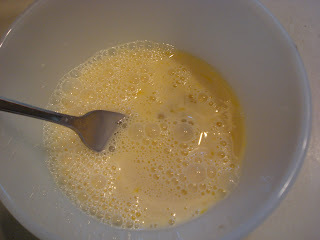 In mixing bowl, beat eggs and sugar til light and fluffy, about 2 minutes. 3. Beat in the butter, then stir in the espresso mixture, ( if using) and the vanilla. 4. With mixer on low, add the dry ingredients, stirring til combined. 5. Stir in the chocolate chips and pecans. 6. 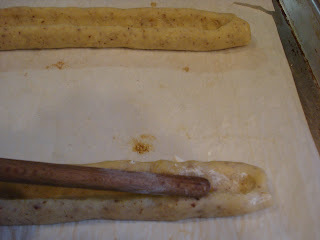 Place the dough onto the parchment lined baking sheet and form into a log, approx. 3 1/2" wide by 18" long and 3/4" thick. Smooth out the top. The amount of butter in the batter allows you to easily form the log using a rubber spatula since it's not too sticky. 7. Bake 20 to 25 minutes, or til firm to the touch on top. 8. Lower oven temp. to 325. 10. 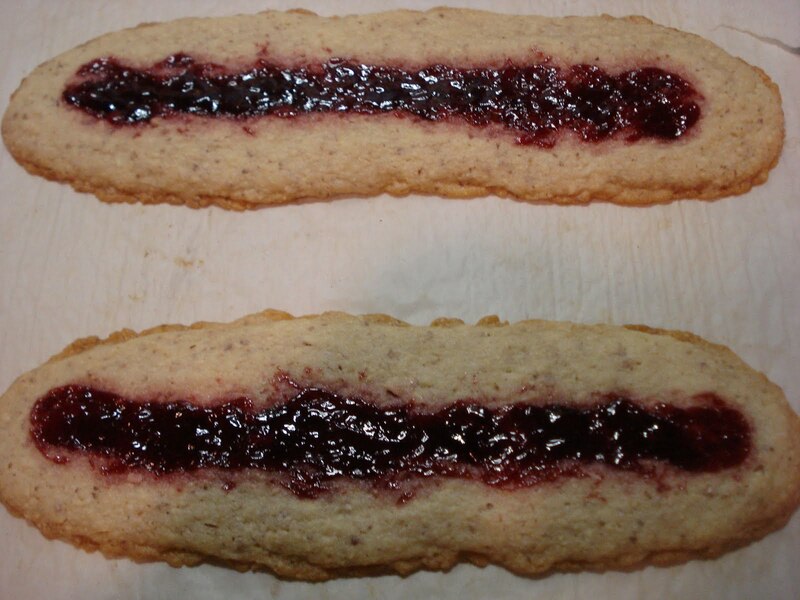 Once the biscotti has completely cooled, slice, using a serrated knife, into 3/4" slices and place slices onto a baking sheet without parchment paper. Rebake 7 minutes on each side. A few mornings ago, while perusing the internet and checking my usual favorite blogs, I saw that this one had a rhubarb cake recipe that I just had to try. It looked wonderful, certainly light and fluffy! Anything this lady makes must be wonderful, so how could I miss? 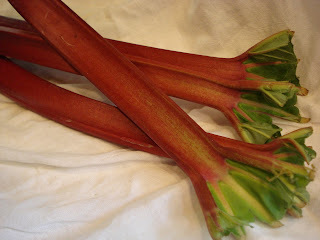 So I set out to find some fresh rhubarb..because I didn't want to use frozen rhubarb again..and I found some! 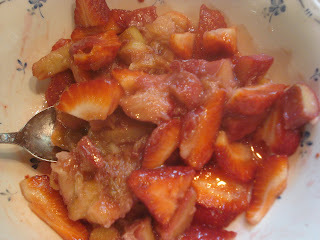 I also bought some more strawberries, thinking I wanted to use them together with the rhubarb. Now I had just made a rhubarb tarragon muffin recipe but I wanted to try another and I thought this would be a good attempt. 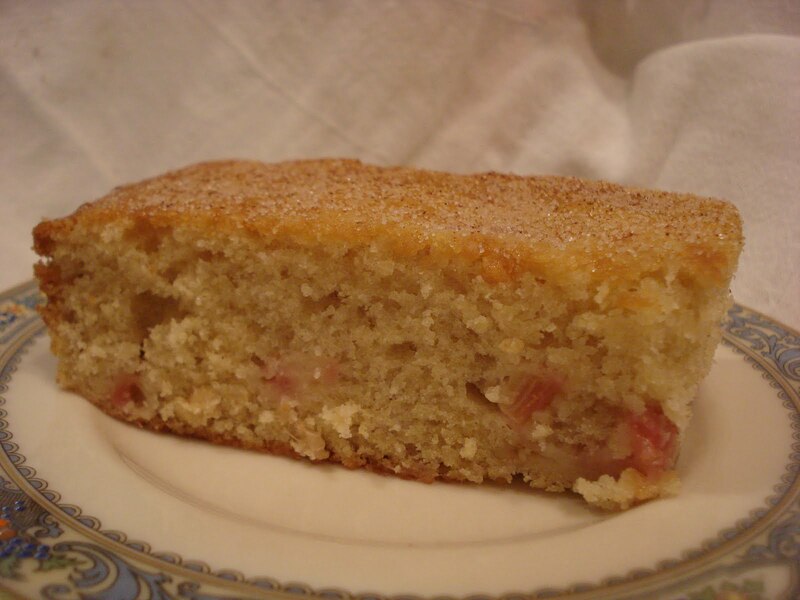 So first I made the rhubarb cake exactly as the original. It was delicious, light and moist. 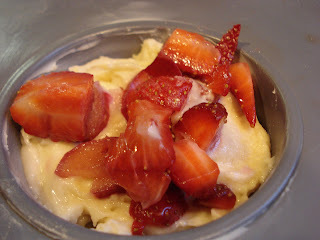 And then I made the recipe again, turning the batter into muffins, using a little more rhubarb for the topping with some cut up strawberries. I thought a streusel topping would make it more interesting, so I used the topping I make for my blueberry buttermilk muffins and they were just great! 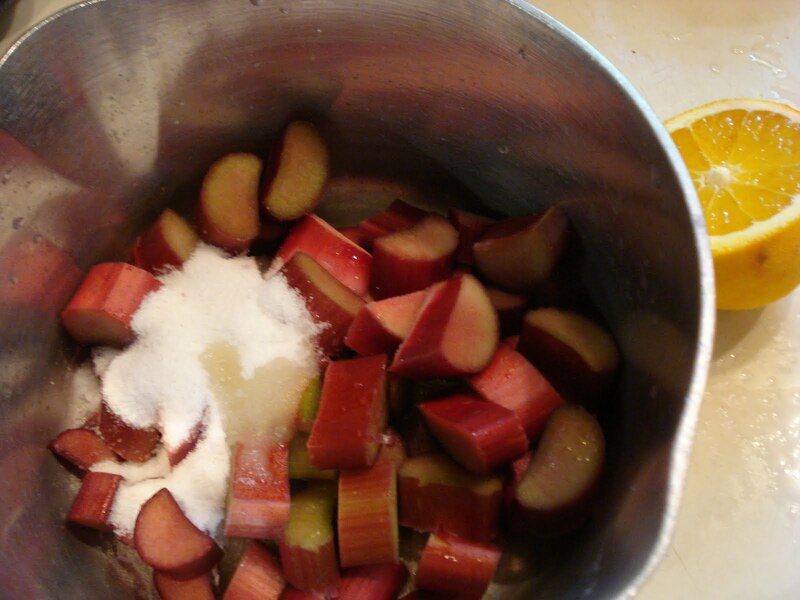 I did place the cut up rhubarb into a bowl with a little bit of sugar. I just felt the rhubarb would be too tart on it's own. Now that I've tasted the end result, I didn't think this step is necessary. Even if your rhubarb is tart(which most is), the tartness would give it a nice "bite" since there's enough sugar to balance it. Once you spoon the batter into the muffin cups, top with some cut up strawberries and rhubarb. 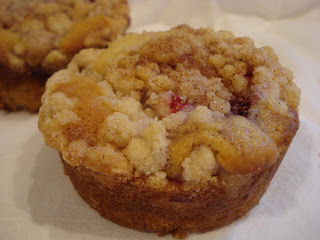 Then cover the berries with some streusel topping and sprinkle with some cinnamon and sugar mixture. Approx. 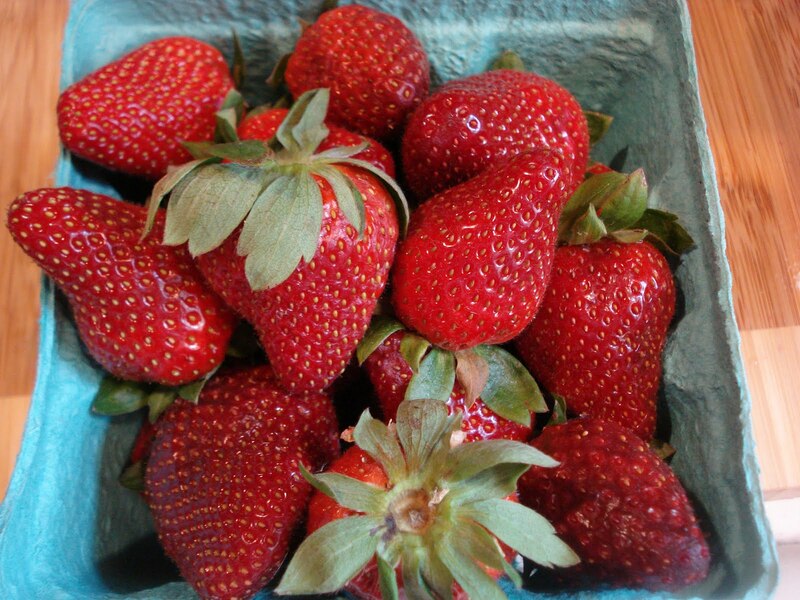 8 to 10 fresh strawberries, cut into small pieces. Preheat oven to 350. Line muffin cups with paper liners or butter the cups and cut circles from parchment paper to fit on bottom of muffin cups (which is what I did, yup..really!). 1. Cream the sugar with the butter til light and fluffy. This needs to be creamed for at least 5 minutes. It must be light and fluffy! 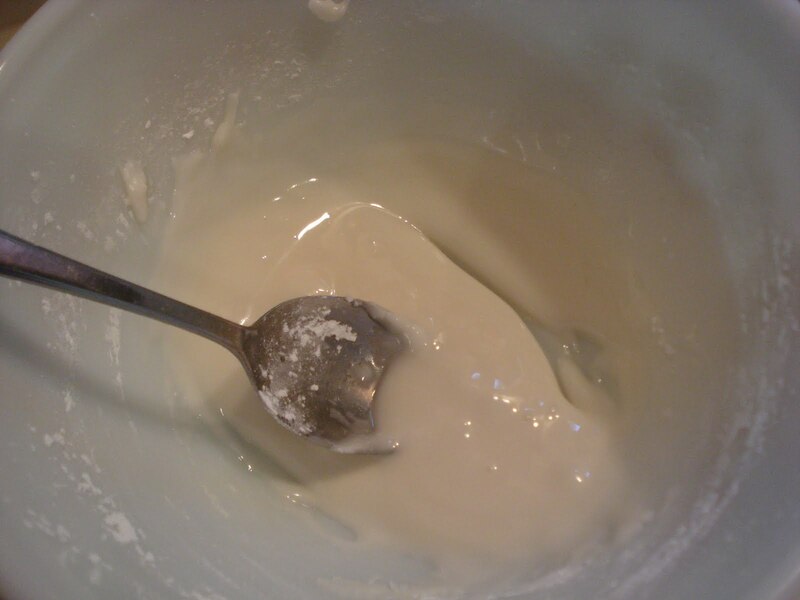 Stop and scrape down the sides and bottom of the bowl as it creams. 2. Add the egg and mix til completely incorporated, scraping down sides and bottom of bowl. 3. Add the vanilla and mix til blended. 4. 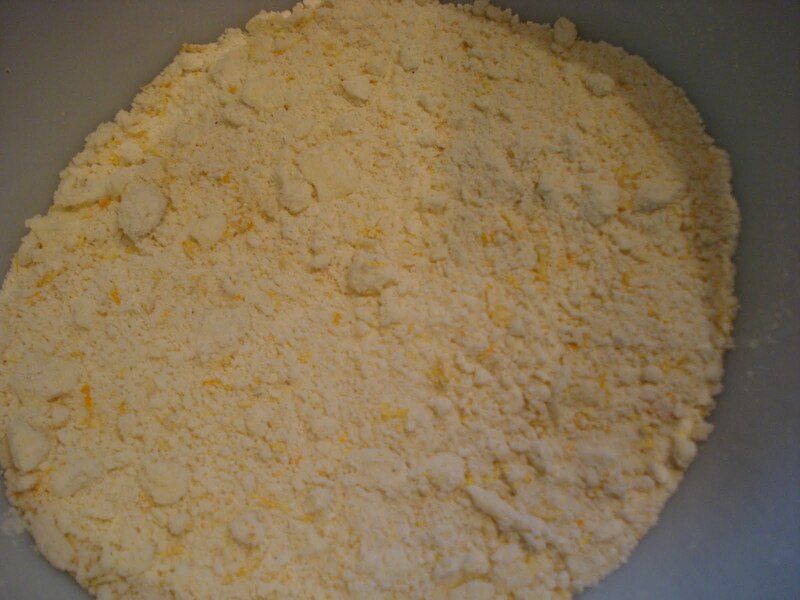 In a small mixing bowl, combine the flour with the baking soda and salt. 5. Add the flour mixture alternately with the buttermilk to the butter/sugar/egg mixture. 6. 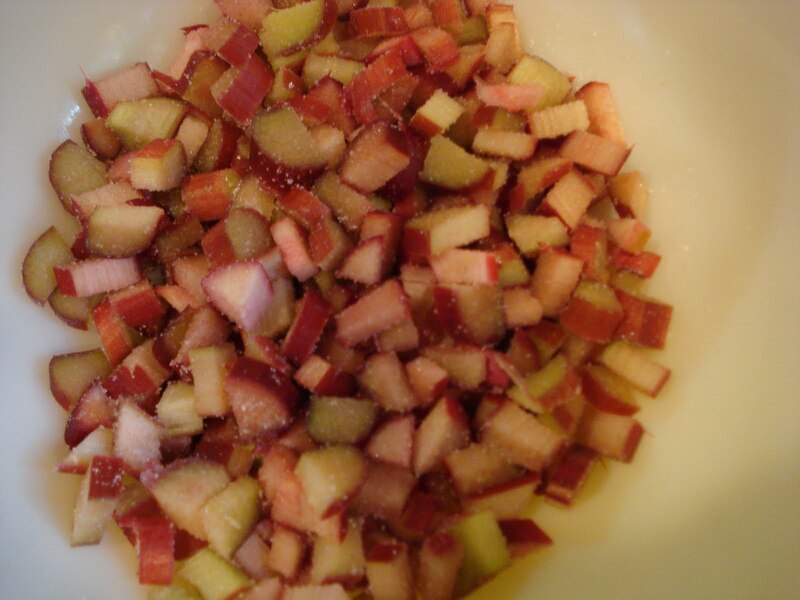 Fold in the 2 cups of diced rhubarb. 7. 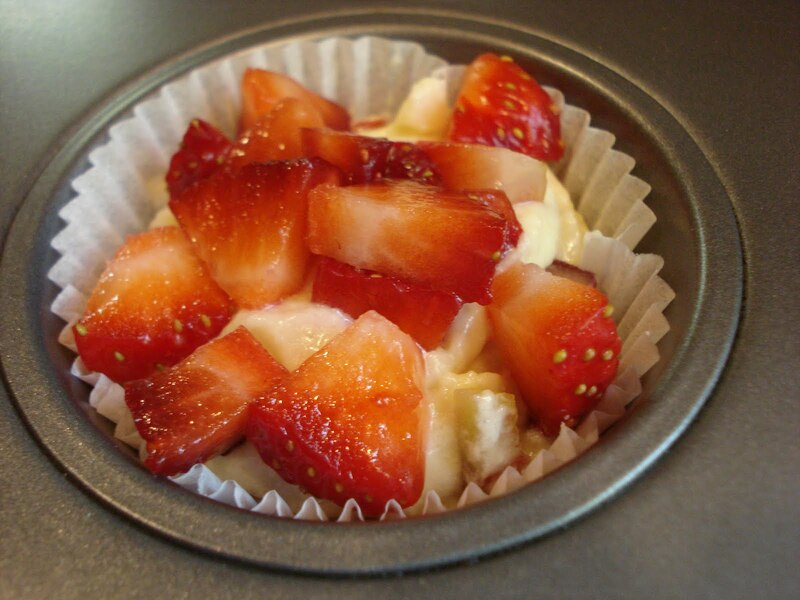 Spoon batter into muffin cups, sprinkle some cut up strawberry pieces and some remaining diced rhubarb on top. Then sprinkle with streusel topping and press down lightly. The sprinkle with cinnamon/sugar mixture. 8. Bake approx. 20 to 25 minutes. Insert a toothpick into center of a muffin to check for doneness. ** Note: I found that the cake and the muffin texture improved after allowing it to sit a few hours. (By this I mean, the "gumminess" that sometimes comes from, I believe, using fresh fruit in batter was more apparent when cutting a piece or eating a piece right away, rather than letting it sit and completely cool.) Sorry..hope this last remark wasn't too confusing! 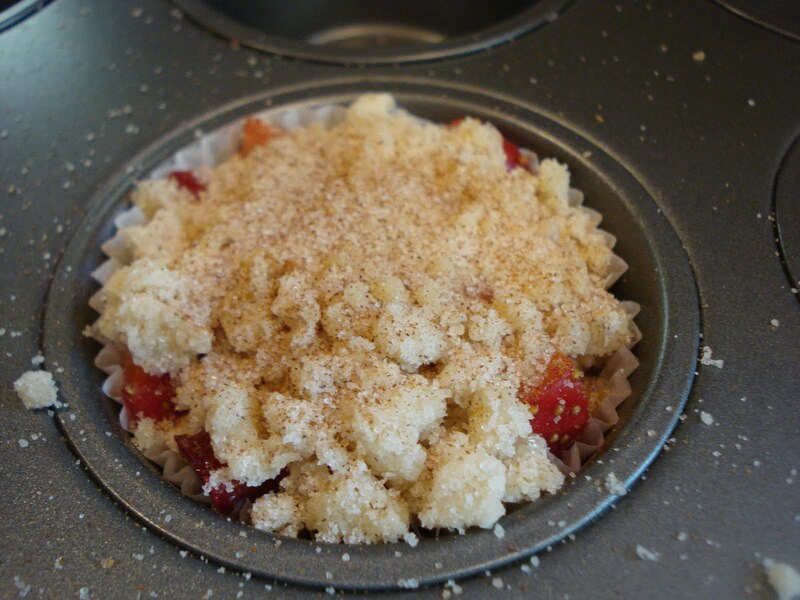 Streusel Topping ( Makes enough for 12 muffins). 1. In microwave, melt butter and cool. 2. Mix all the other ingredients in a bowl and add the melted butter. Stir with a fork til all is blended and mixture begins to form crumbs. 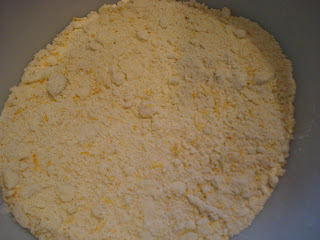 Gently squeeze the mixture to form larger clumps, then break them apart. Let streusel sit about 15 minutes before using. This recipe comes from the newest issue of Food & Wine Magazine. It sounded like a cookie that would be crunchy and full of flavor. 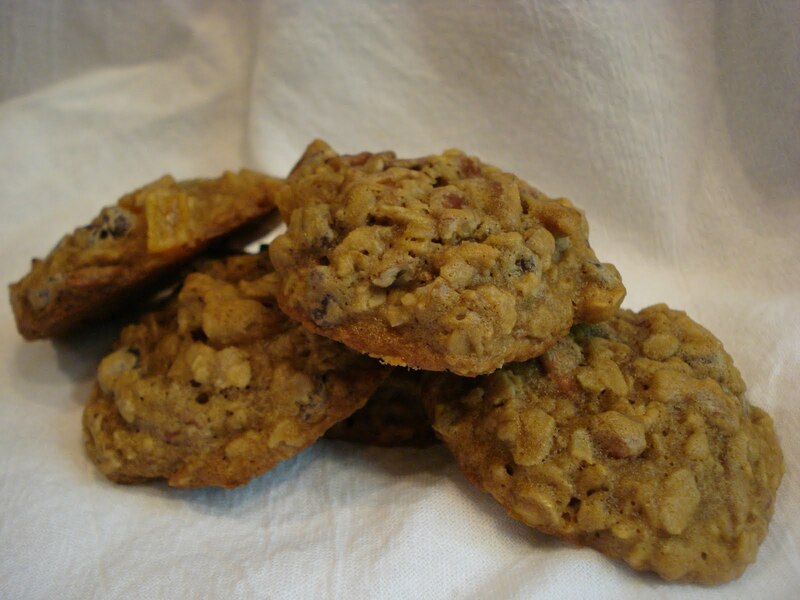 With all the add ins, it certainly was chunky and chock full of stuff..pecans, dried apricots, oatmeal and chocolate chips but with all that I really wasn't too crazy about it. I didn't care much for texture, which was soft, due to the only sugar being the dark brown sugar. And it could have used more sweetness with some granulated sugar. Lastly. I think dried cranberries would have added a bit more punch of flavor than the dried apricots which are kind of mild tasting. Keep in mind, this is only my opinion and I'm sure many of you will love it! So give it a try and get back to me on your opinion. I'd love to know what you think. I just had another idea, dried cherries would be great with the chocolate chips, too! 1/2 cup dried apricots, cut into 1/4" dice. 1. 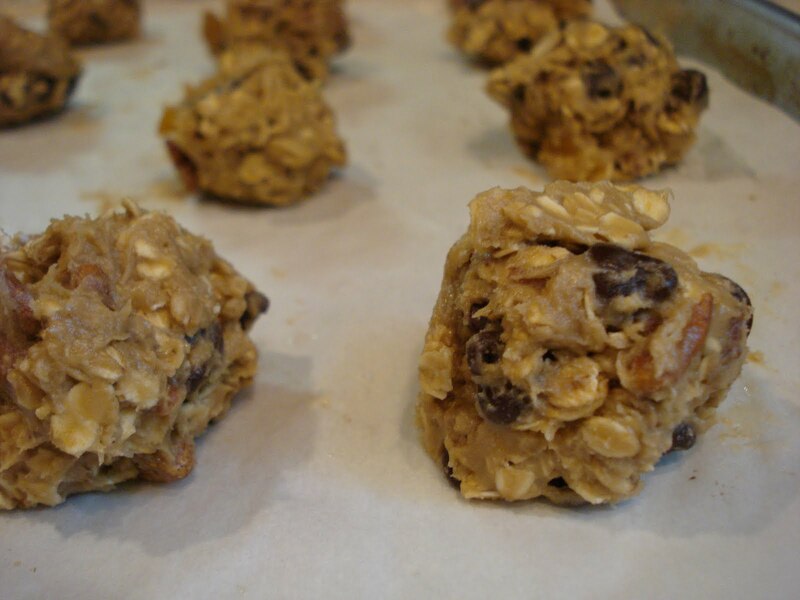 In a small bowl, mix the oats with the flour, baking soda and salt. 2. In a large bowl, using a handheld electric mixer, beat the butter with the sugar at medium speed til it's light and fluffy, about 2 minutes. 3. Add the eggs and vanilla and beat at medium speed til blended, scraping down the sides of the bowl as necessary. 4. Beat in the oats mixture at low speed til it's just incorporated. 5. 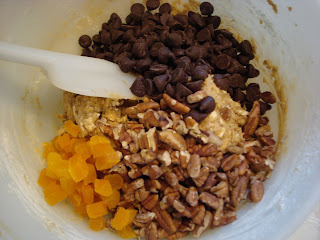 Using a large spatula, fold in the toasted pecans, chocolate chips and dried apricots. 6. Scoop heaping tablespoons of the dough onto 2 baking sheets, lined with parchment paper, spacing them 1 1/2" apart. 7. Bake for about 16 minutes, til lightly browned, rotating pans and shifting from top to bottom, halfway through. 8. 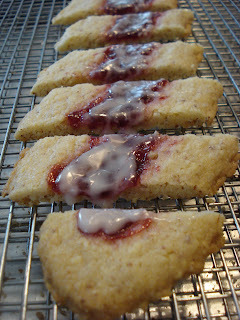 Cool cookies on sheets 5 minutes, then transfer to a wire rack to cool completely.